Leeds captain Kevin Sinfield paid tribute to Rhinos coach Brian McDermott as the "mastermind" of the club's first Challenge Cup win in 15 years. After ending a personal run of five final losses by leading Leeds to a 23-10 win over Castleford, Sinfield said the key was avoiding "champagne rugby". 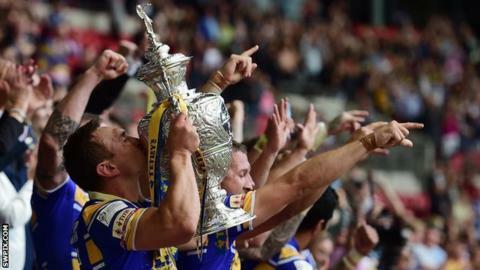 "The players will get a lot of credit but that was masterminded by our coach," Sinfield told BBC sport. "This win was about us being absolutely ruthless when it mattered most." He added: "We have some guys in that dressing room that want to play champagne rugby, which has worked for us in the past. "But today was about putting in a ruthless performance and sticking to a game plan masterminded by Brian McDermott. "The win against Warrington in the semi was down to his game plan too, and I'm delighted for him." The Rhinos had suffered six Challenge Cup final defeats since becoming the last side to win at the old Wembley in 1999, when they crushed London Broncos 52-16. Sinfield was only a spectator that day and has since been part of six losing Leeds sides - twice at Cardiff, once at Murrayfield and, having returned to Wembley, three times in a row between 2010 and 2012. "To lose five as skipper has been horrible," said Sinfield. "So to finally get our hands on the trophy is really special - not just for us and our coaching team but the supporters who have had to keep coming down to London and spending their hard-earned money only to drive back up the M1 disappointed and disillusioned. "This was all about perseverance as a club. "Hopefully, this time, while it does not erase those five or six defeats, we've sent them home smiling." Only Wigan with 19 triumphs have enjoyed more Challenge Cup final wins than Leeds, whose victory equalled St Helens' tally of 12. Sinfield also paid tribute to two-try winger Ryan Hall, whose remarkable strength saw him grab the brace that won him the Lance Todd Trophy - Leeds' first winner of the famous man-of-the-match award since Sinfield himself earned the honour in a losing side against Hull in 2005. "He's world class," added Sinfield. "The best winger in the world." Hall told BBC Radio Leeds: "I've been here six times, twice with England as well, so that makes this feel all the more special. It's a great day for us." Now the most successful coach in Leeds' history, McDermott got the better of opposite number Daryl Powell, one of his predecessors in the role. But McDemott said: "Cas should not be ashamed of that performance at all. We never had it in the bag. "For all the fans who have been involved in every tackle and every carry in all those losing finals, and particularly for our players who have been losers so many times, this was special. "It's great for young Liam Sutcliffe who now has a gold medal. But it means more when you've had to put up with wearing a few silver medals first."